Nothing could be more Romantic than the English Folk tradition as it was revived at the start of the twentieth century. 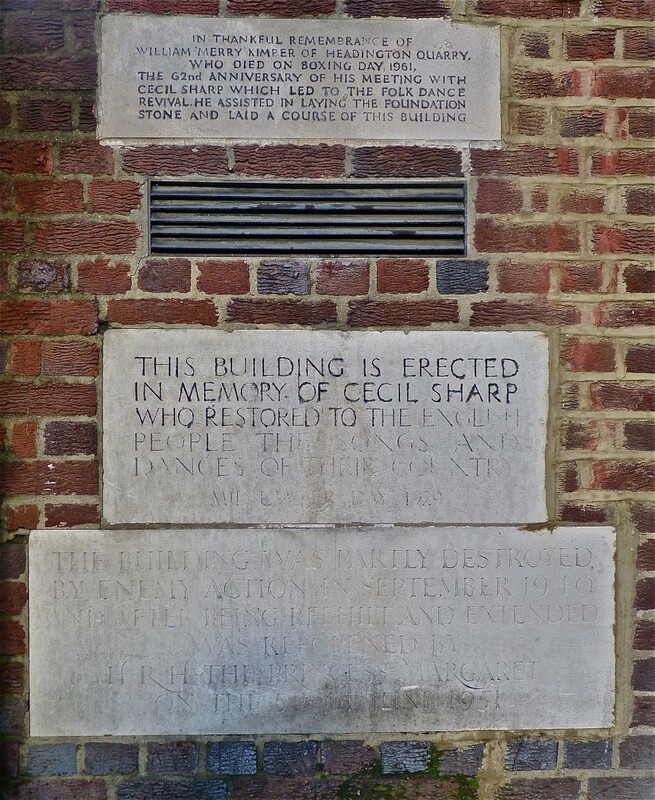 Much of the glory for this belongs to a single character, Cecil Sharp, for whom Cecil Sharp House was built as a memorial, library and archive, and a living home for the English Folk Dance and Song Society, or E.F.D.S.S . 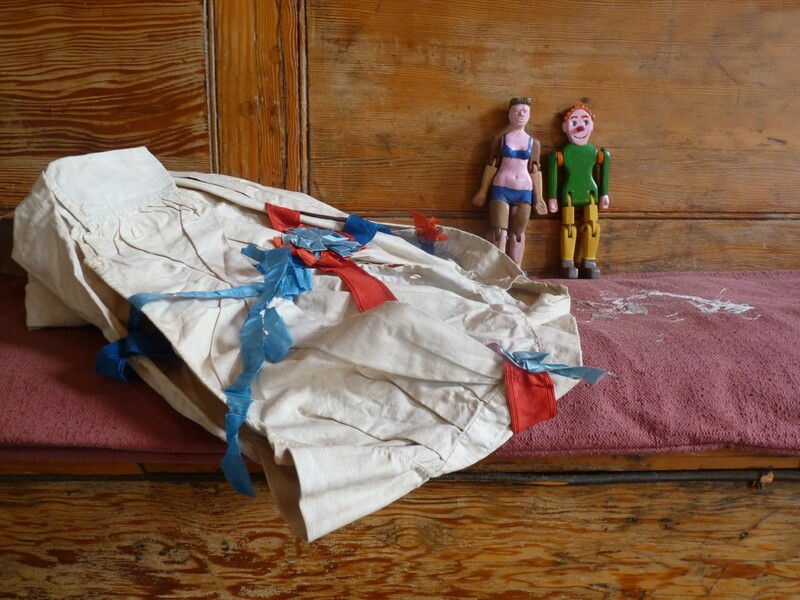 A century old ribbon-garnished Morris smock and wooden jig-dolls on the benches in Kennedy Hall, where some dance societies have embroidered their monographs onto the cushion seats. 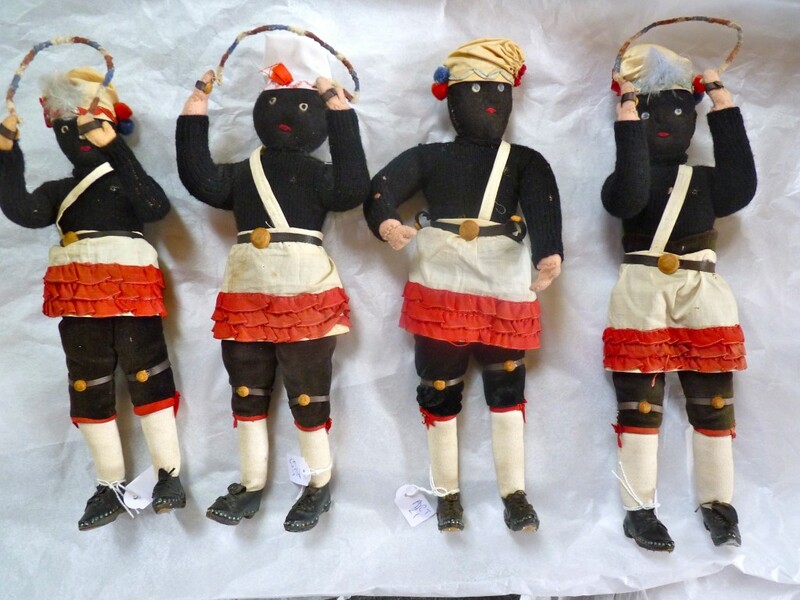 When Sharp began collecting and transcribing regional folk songs, there were still a few bands of mummers and morris men, green men and horn dancers, performing for their local populaces in rural backwaters. He became consumed by the task of touring these country places, stopping at inns and cottages, coaxing their elderly occupants to sing and play for him and saving their words and music from oblivion. He published song books for teachers, bowdlerising lyrics that were filthy or violent so that these healthy recreations could become part of school curriculums, sweetly preserved at many a village pageant or village green, where children tripped and tangled around improvised maypoles. 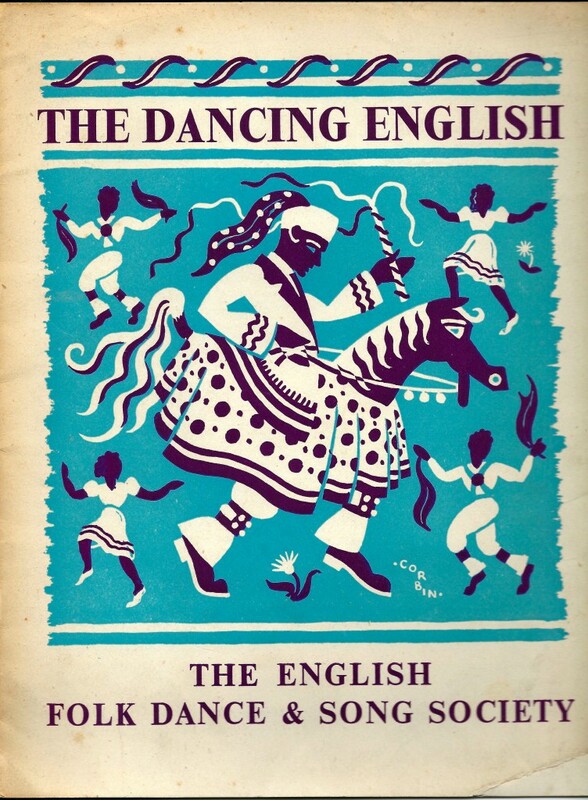 Undated mid C20th illustrated pamphlet on English folk dances published by the E.F.D.S.S. (author’s own, via ebay). By the time of his death in 1924 folkish idioms were in tune with the national post-war mood, chiming with arts and crafts furnishings and vernacular architecture and George Butterworth and Ralph Vaughan Williams had co-opted their lilts and harmonies into their musical repertories. 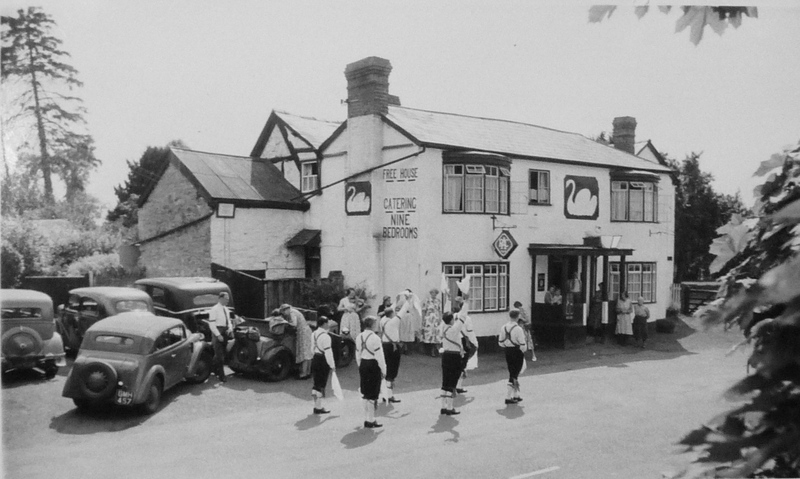 Even in the new suburbs, manly bands gathered at the end of the working day with swords, handkershiefs and bells stitched on by dextrous wives to dance the morris together. 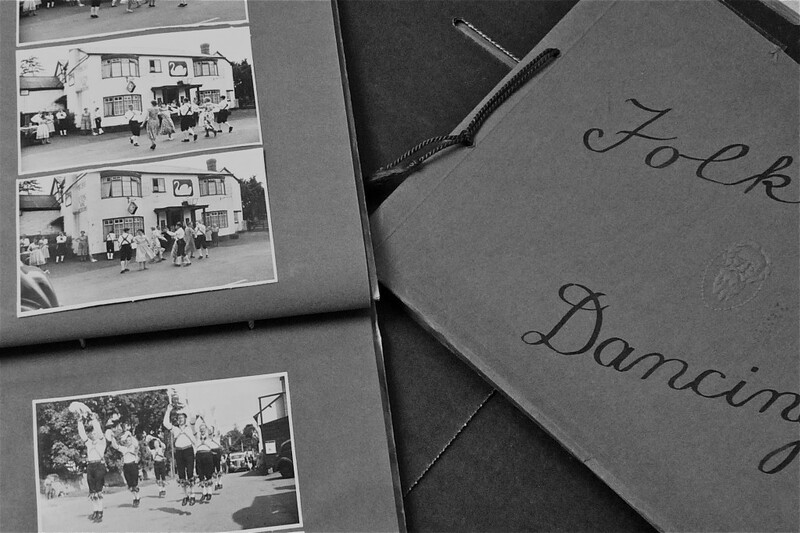 Albums of small, amateur black and white photographs record the macho camaraderie of the morris throughout the 1930s, 40s and 50s, sometimes enacted on grass but more often on a pub car park, with thighs rhythmically flexing and calves and bottoms bouncing as the dancers pirouette, stamp, salute, approach and retreat, platoons of virile, moustached Englishmen drilling themselves with soldierly rigour. 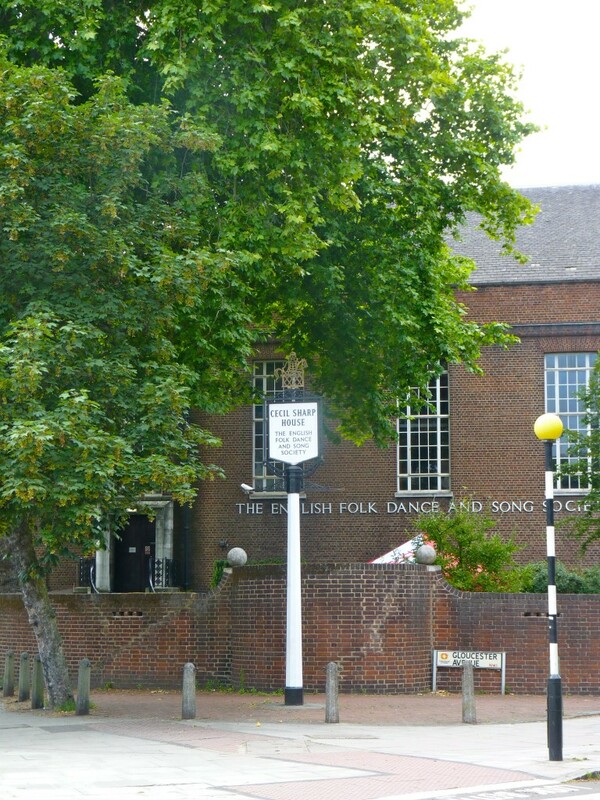 Cecil Sharp House was built as a national headquarters for the folk movement which would keep Sharp’s work alive. You come upon it beyond the sleazier parts of Camden Town, straddling a triangular plot where tree filled residential streets march on Primrose Hill. Inside there are practice and performance halls, offices and a library. Note the little metalwork ‘Obby ‘Oss on the top of the pole. 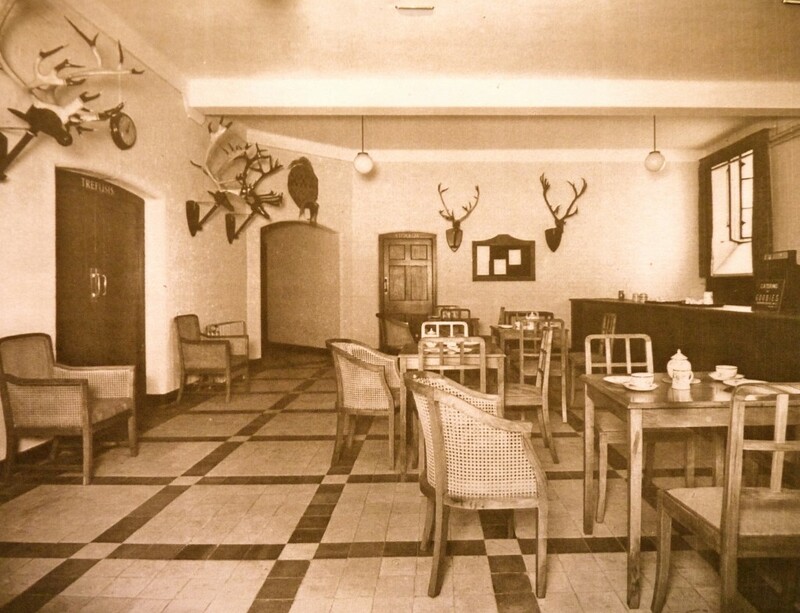 But the furniture and fittings seen here, made by Heals and Sons of Tottenham Court Road were smashed to fragments on an autumn day in 1940, when four incendiary bombs landed on the still new building. As rebuilt after World War II it was cheaper, lighter and more utilitarian. 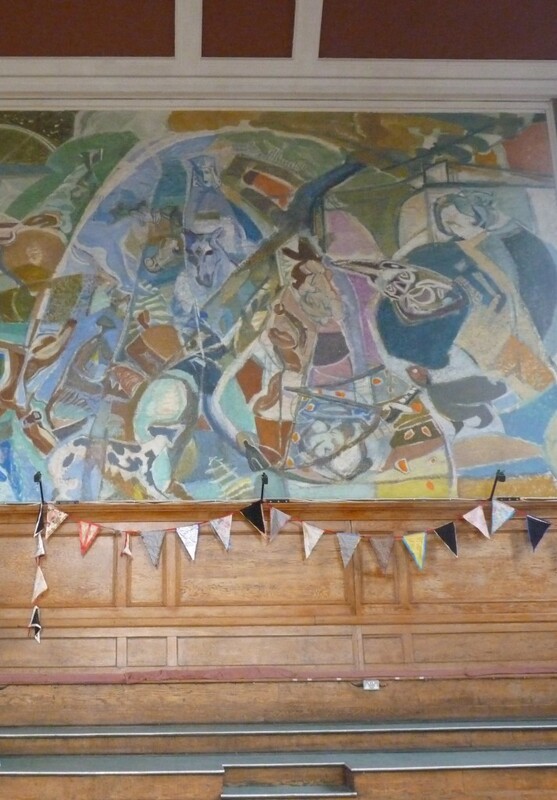 A modern metalwork portico carried little flattened brutalist reliefs of morris men by (Sir) Anthony Caro and in the damaged great hall a mural of dancers in a woodland setting by Ivon Hitchens arches over the wide expanse of bouncy sprung dance floor. 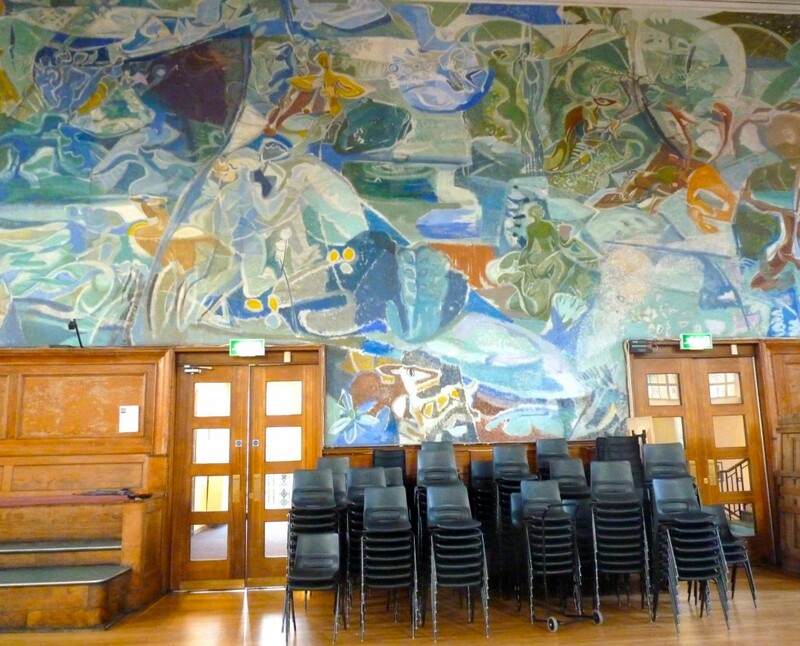 ‘The Dance,’ mural by Ivon Hitchens, 7 x 21 metres, installed in 1954. It is set in a mythical wood peopled with Horn Dancers, a May Queen and and an ‘Obby ‘Oss . The cartoon is in the Tate. Many of the Society’s archives and collections had also been lost to bomb damage but a continual trickle of unsolicited donations has been arriving here ever since. 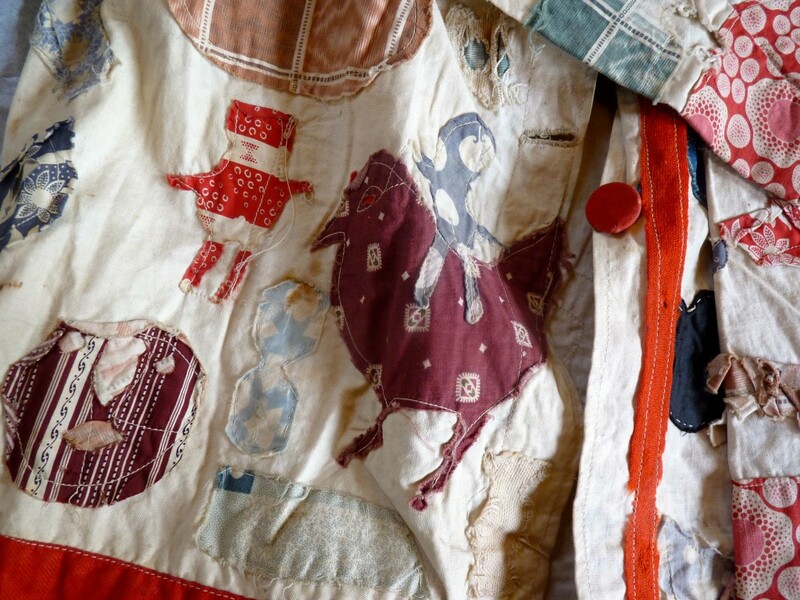 Boxes packed with sheets of acid-free tissue disclose a heavy sashed linen smock patched and stained with the marks of its wearer’s exertions, or hand-carved ‘jig-dolls’ which once thumped out their puppet shows for the delectation of long dead drinkers in some rural pub. 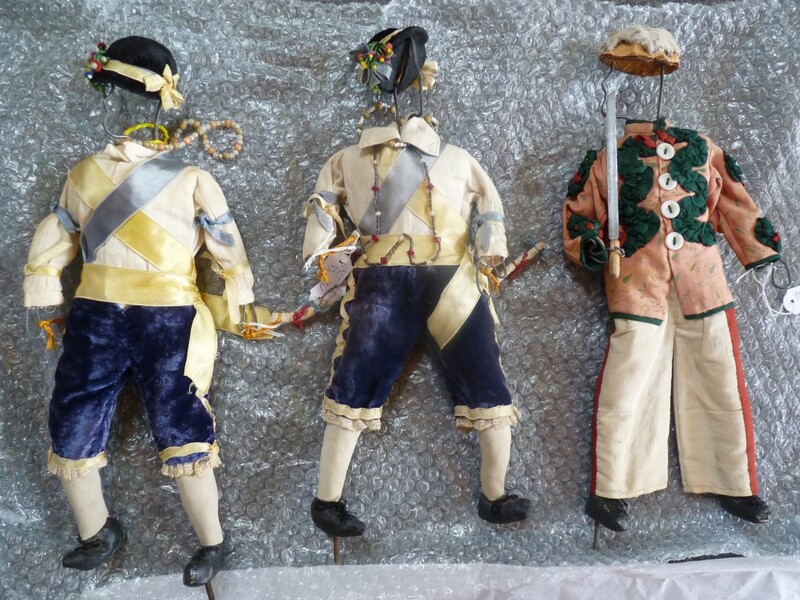 One nimble stitcher has created a whole series of miniature dolls framed on wire bodies dressed as the dancers and fiddle players of the Cotswolds’s Bampton morris troop, clothes-horses with carefully trimmed hats, froggings and tiny leather shoes. These are four of the ‘Coconut Dancers’ of Bacup in Lancashire, who dance in a team of eight . 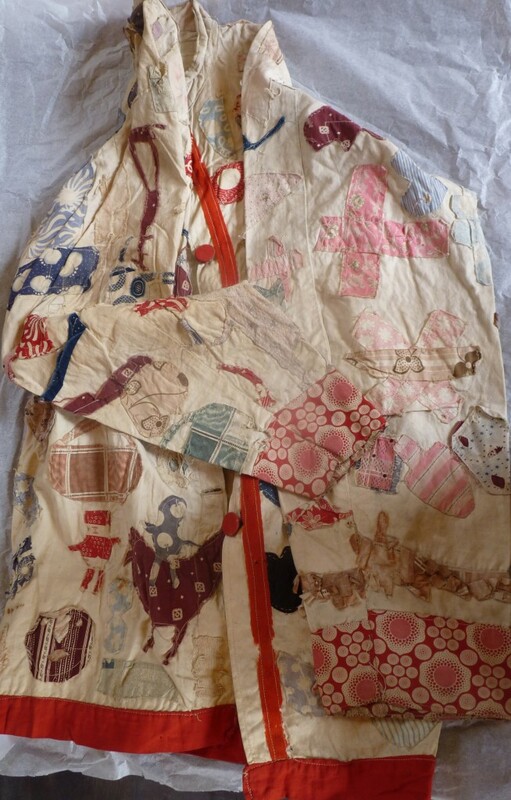 A patchwork applique jacket by an unknown maker. 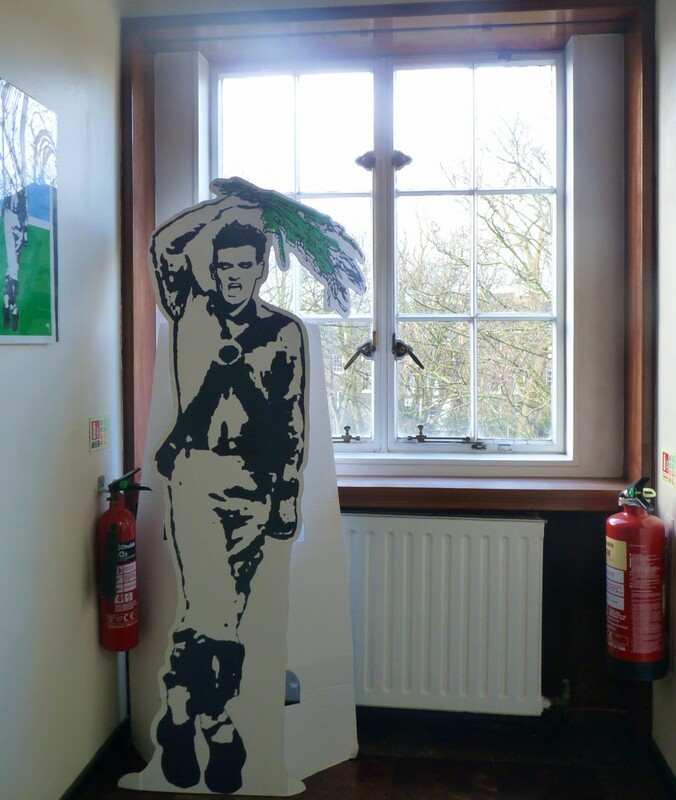 In the library here there are collections of printed Broadsheets, the earliest versions of folk song lyrics, printed music sheets and even diagrams of the dance steps which went with them. 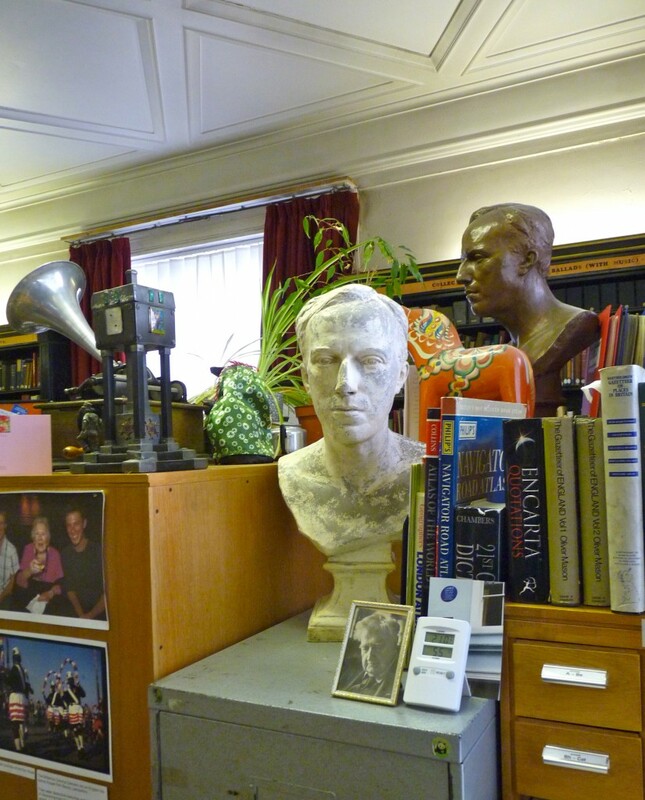 The bust is Sharp and the photograph is of Ralph Vaughan Williams. 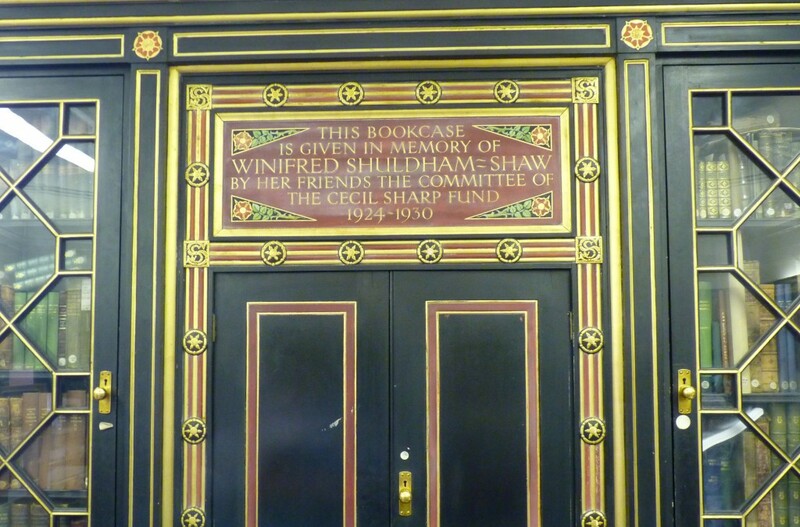 The Library still has its original glazed and ebonised bookcases by Heals which line the walls. The E.D.F.S.S. had a long and honourable relationship with the best of artists, designer and craftsmen. 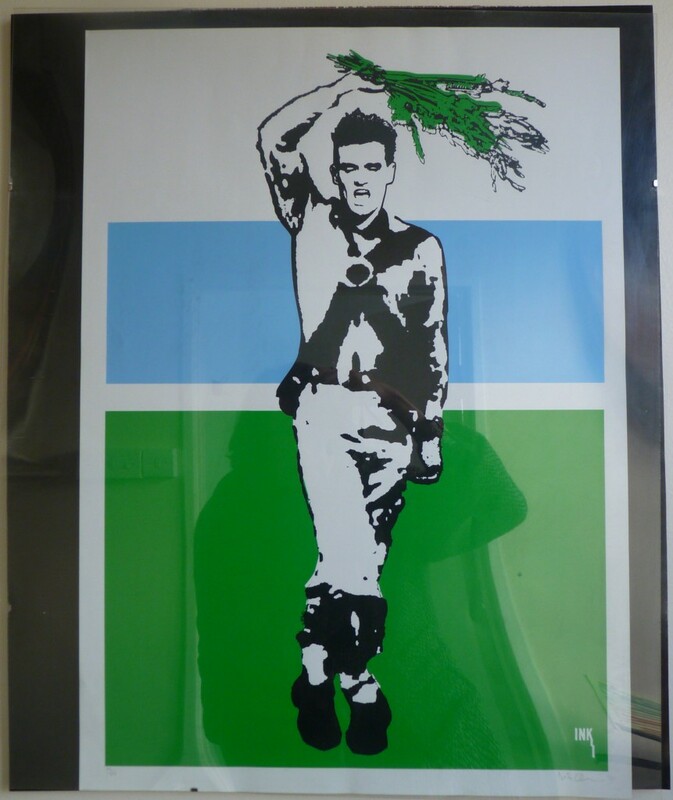 David Owen of the Ink Corporation produced his ‘Morrisey’ tribute a few years ago. If I was a better guitar player I would form a ‘folk Jesus and Mary chain’ and incite a riot at Cherry Hinton…. Most of my work is concerned with folk music and its image. Folk music is usually portrayed, or perceived, as ancient, pastoral, vintage, frozen in time – the usual stereotypes of beards, jumpers and fingers-in-ears. But folk music is an evolving, living, contemporary vehicle for transmitting stories and ideas, lives, loves and fears – the human condition. Folk songs have evolved over decades and across generations, sometimes over centuries. Names get changed, locations get moved, modern events are incorporated, the songs grow, change shape, adapt, evolve, and mutate. When Cecil Sharp, Vaughan Williams et al travelled the country to collect and record the songs, they inadvertantly ‘froze’ them in their recordings and writings. They have subsequently been seen, by some, as complete, finished and definitive. Folk songs are dead unless they continue to be sung, told, exchanged, re-worked, adapted and re-interpreted. 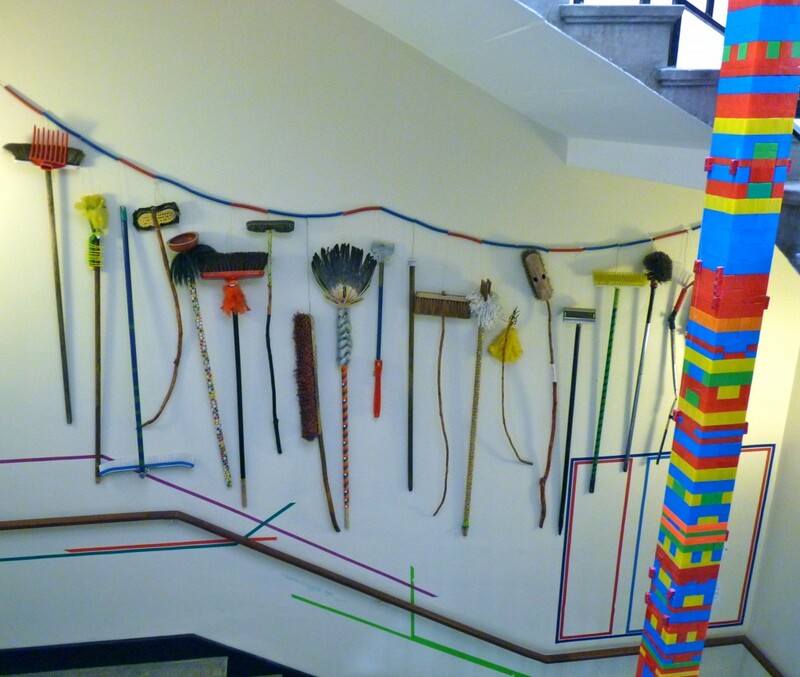 Matthew Cowan’s temporary installation of ‘ ritual brooms ‘ on the stairwell at Cecil Sharp House, ‘I’ll Sweep your House,’ in c.2010/11. Matthew Cowan, Exotic England, A Bus trip Through the Cotswold Morris Villages, 2009. 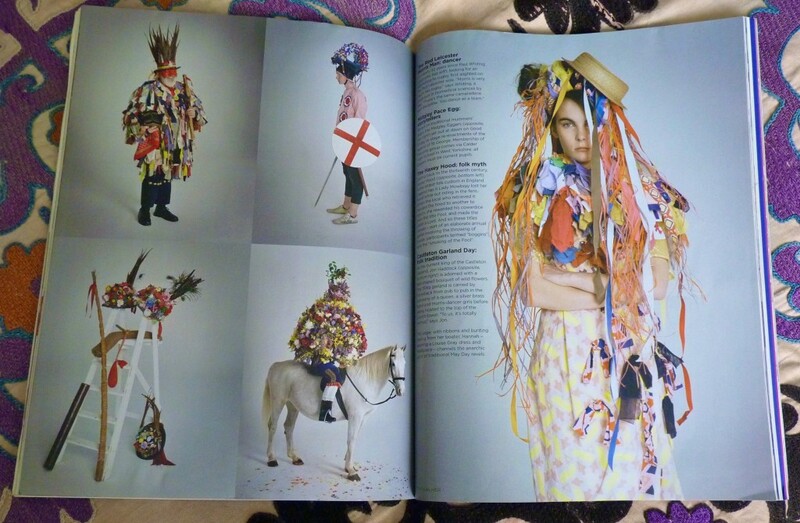 Vogue’s folkish 2012 photo shoot featuring Simon Costin, whose Museum of British Folklore recently curated an inspirational photography exhibition at the Towner Art Gallery. 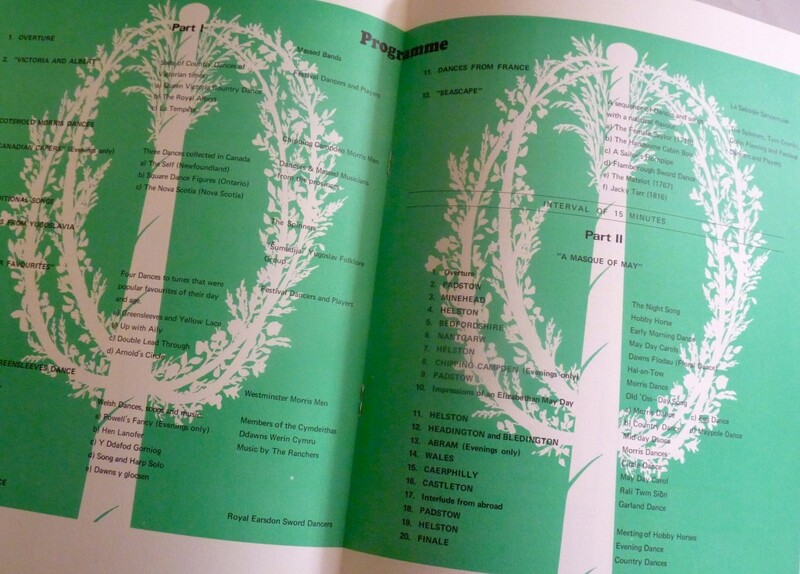 Costin’s manifesto is to ‘promote, celebrate and revitalise the folk heritage of Britain;’ he curates another exhibition based on the archive of Sword Dancer Trevor Stone at the EFDSS later this year. 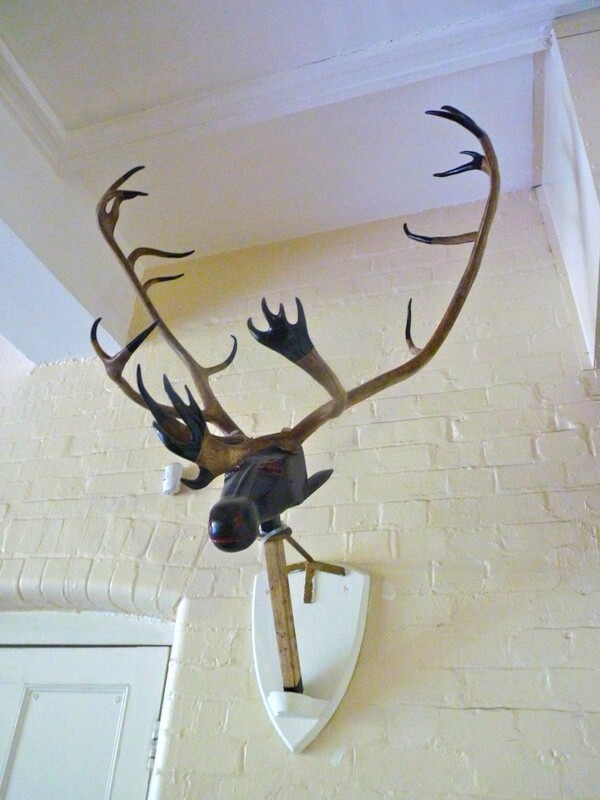 Relic of the Abbots Bromley Horn dance, said to be an ancient fertility rite; the horns and other costumes hang in the parish church throughout the year until September Wakes week, when they are brought out and handed to the dancers by the vicar. 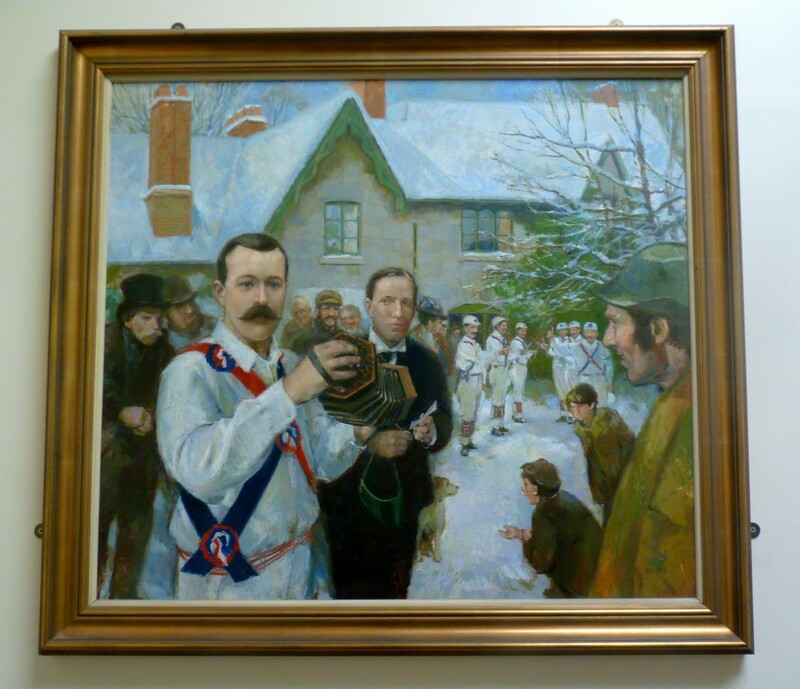 ‘The Folklorist’, by an unknown artist: Cecil Sharp meeting William Kimber in 1899, with notebook and attentive expression. One of the first song tunes which Sharp himself collected was The Seeds of Love, the lyrics of which had been printed in many different forms and under different titles, one early version dating from 1657. Sharp first heard it one morning in 1903, sung softly by John England, a Somerset gardener, as he mowed a lawn : I sowed the seeds of love / And I sowed them in the Spring. / I gathered them up in the morning so soon / While the small birds do sweetly sing. Like a lepidopterist with his net, Sharp caught both the words and their tune. The stone slab which was set into the wall of his eponymous building on Midsummer Day in 1929 commemorated Sharp, ‘who restored to the English People the songs and dances of their country, ’ and it is for the preservation of such beauty and sweetness that he is remembered as a hero to the dozens of societies and people who still dance, drink, sing and congregate here. 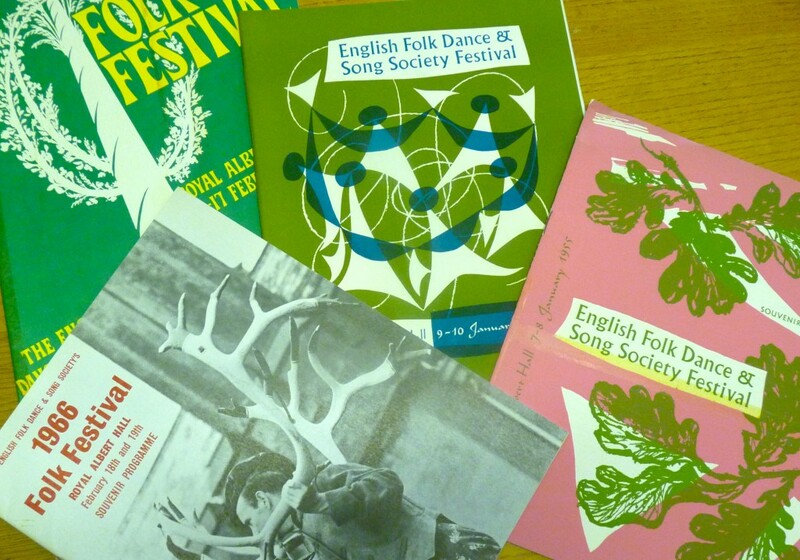 The English Dance and Folk Song Society has dances and classes and workshops and performances going on all the year round. Helen runs the excellent Cafe and Jerry is behind the wood paneled bar serving the best beer. 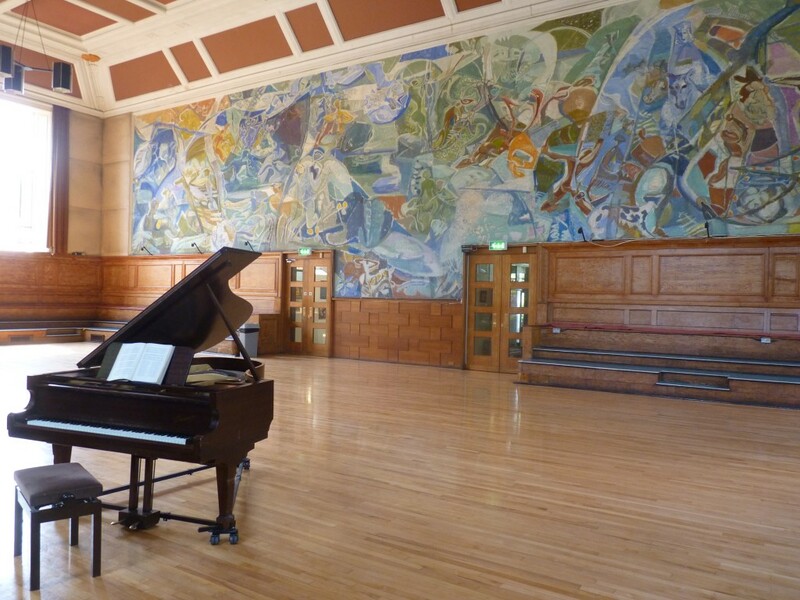 You can hire Kennedy Hall with its grand piano, sprung dance floor and panoramic Hitchens mural for a party or the downstairs Trefusis Hall, where the Abbots Bromley horn headdresses hang on the walls. When my daughter and her friend had their Confirmation party here we garlanded them with firecracker bright dahlias tied with binder twine. (Constance Spry once did a rustic village hall wedding reception with bicycle baskets stuffed with flowers and hung along the walls at dado level). For a very faithful rendition of The Seeds of Love, watch the 1967 film of Thomas Hardy’s Far From the Madding Crowd, with Julie Christie, Alan Bates and Terence Stamp. It’s probably on Youtube. May Pole dancing and morris men and folk were part of my primary school-aged life and, like the comforts of religion, I still seek them out wherever they may be found. 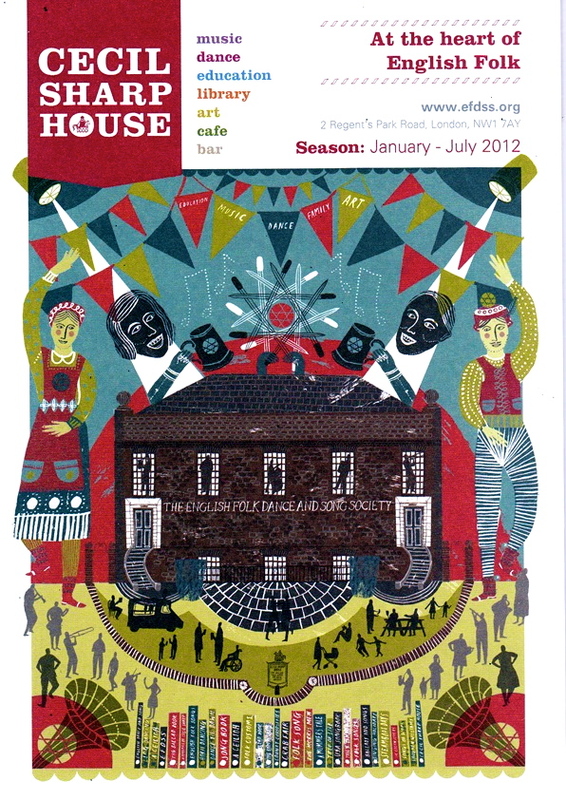 With many thanks to the EFDSS and its director, Katy Spicer. 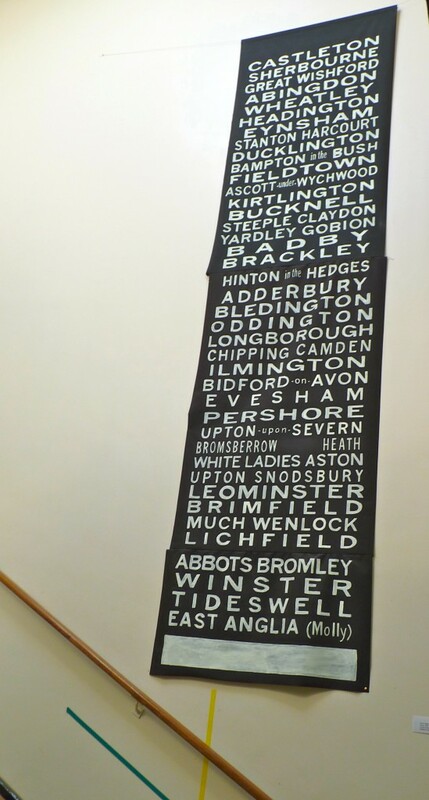 An excellent collage of photographs together with a succinct resume-there must be many members of the EFDSS like myself,who have only briefly visited Cecil Sharp House (if at all),age and distance limiting the opportunity-but,like the stars,you may not see us all the time,but we’re still out there! Good to be able to see the display in this way;with kind regards to all.